With their new restaurant design, Snøhetta doesn't only take it to the next level, they literally bring it to a deeper one. Ever played the first two games of the video game series, Bioshock? 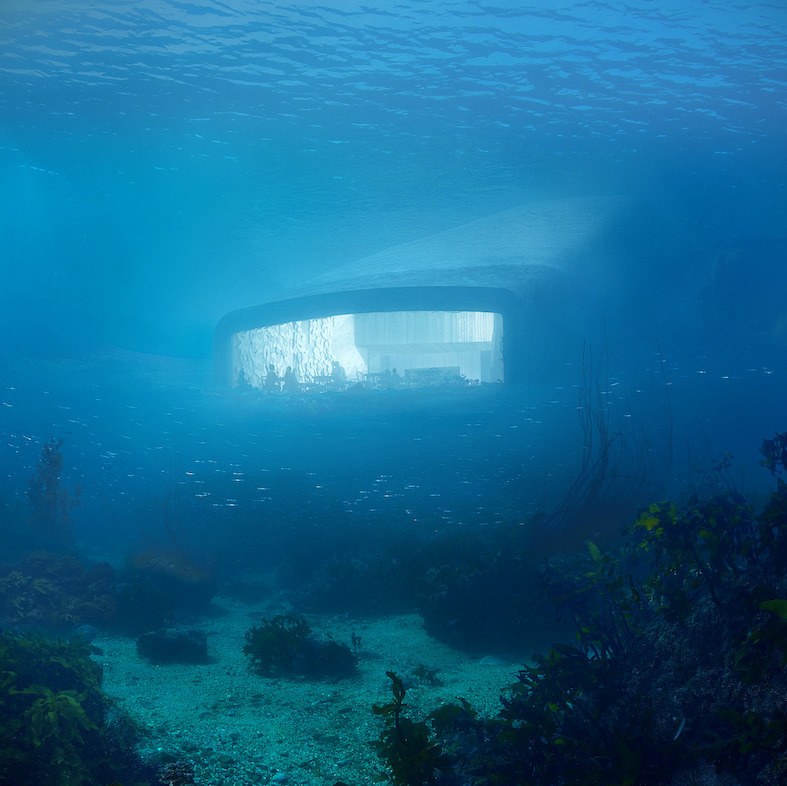 If so, Snøhetta's design for this underwater restaurant might trigger a tinglingly delightful reference to the deep blue city of Rapture, as if this might be the realisation of the latter. Intriguing for any gaming enthusiast, indeed. But despite your personal preference of potential virtual entertainment, this astonishing building is still incredibly intriguing for anyone interested in architecture. Or marine biology. Or highly skilled engineering. Or even the wonders of modern technology, for that matter. It is a restaurant under water. The first of its kind in Europe. The construction is named Under—a word that carries the same meaning in both Norwegian and English, as well as being the Norwegian translation of wonder—and is located facing the open sea at the edge of Blåly, only ten minutes away from Norway's most southern point, Lindenes Fyr. In contrary to other underwater concepts, Under is not merely an aquarium, but rather looks and functions as a pair of underwater binoculars. Resting on the five metre deep bottom, the massive concrete construction gives a season-varied view of the natural and rough sea-life which is characteristic for the southern shoreline of Norway. In the shape of a pipe, the restaurant dives from the bare rock-face and down into the sea. The many-metre thick concrete walls are covered in a rough texture, allowing sea shells and mussels to form and attach to its surface, which contributes to naturally cleansing the sea as well as eventually transforming the restaurant into an artificial reef, and thus a natural part of its environment. The entry to the restaurant is an experience in itself. Starting at the parking lot of Lindenes Sea Hotel, an illuminated coastal path guides the visitors through a story of the biological diversity of the Norwegian coast and sea, before leading to the entry and an oak covered wardrobe area. The second floor takes the shape of a Champagne bar from which you can look down into the restaurant itself—consisting of three long tables and a number of smaller tables placed in front the 11 x 4 metre acrylic window giving direct view of the ocean floor. The restaurant can serve up to a hundred people and will specialise in local sea food of the highest quality.